Taliban-Claimed Attack On Afghan Police Trainees Kills Dozens, Reports Say : The Two-Way Two suicide bombers struck a convoy of buses carrying recently-graduated Afghan police cadets, according to wire service reports. The Taliban has claimed responsibility. Afghan police inspect the site in in Kabul, Afghanistan, where a bus convoy was attacked on Thursday. 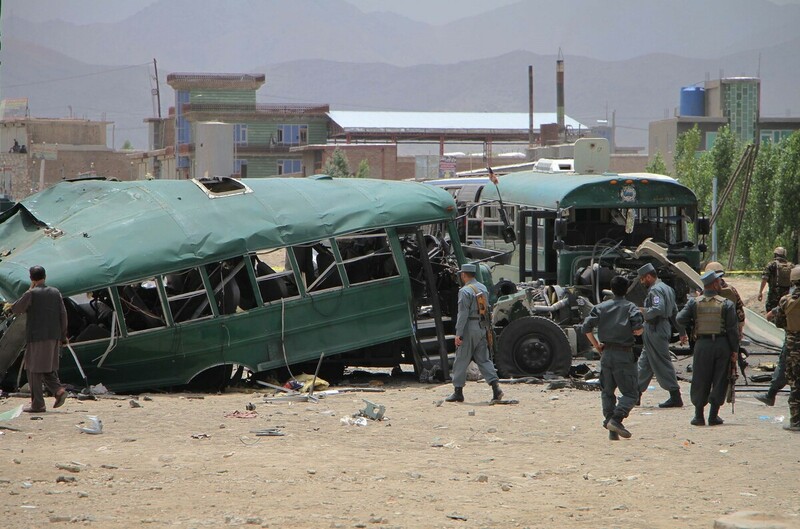 The buses carrying police cadets were targeted as they were on their way from the neighboring Maidan Wardak province to Kabul. Two suicide bombers attacked a convoy of buses carrying Afghan police trainees, killing at least 30 people, according to reports from The Associated Press and Reuters. The attack occurred about 12 miles west of Kabul, the AP says, citing the Paghman district governor, Mousa Rahmati. More than two dozen police trainees died, as well as four civilians, the AP says. The attack involved two explosions, Rahmati told the AP. "The first suicide attacker struck two buses carrying trainee policemen, and a second attacker targeted those who rushed to the scene to help and hit a third bus," the wire service writes. The police cadets and their instructors were returning from a training center in the province of Wardak, the AP reports, and were about to begin a period of leave in the capital. The cadets had only recently graduated, Reuters reports. The U.S. Embassy in Kabul has condemned the bombings as a "horrific, multi-part attack on Afghan National Police and civilians." "This cruel and complete disregard for human life during the holy month of Ramazan is abhorrent," the embassy said in a statement. Ten days ago, an attack on a bus in Kabul killed 14 Nepalese security guards who worked for the Canadian Embassy. There are conflicting claims of responsibility for that bombing, the CBC reports, with both the Taliban and the Afghan affiliate of the Islamic State saying they were responsible. In April, a Taliban-claimed attack on an elite security unit killed 64 people in Kabul.